Backing up your data is vital. It’s one of the crucial maintenance activities that has to performed on a regular basis. Keeping a backup ensures that if anything goes wrong with your site, you can still restore it using the available backup. This article focuses on how to create a backup of your WordPress database manually without the use of any third party plugins or services. 9 What is the WordPress wp-config.php File? 10 Why Create Database Backup Manually? WordPress has become an essential part of the web world. It’s ease of operation and simplicity has attracted the attention of people from different professions. However, it’s simplicity and ease of use sometimes creates an illusion that nothing can go wrong with a WordPress site. But the fact is, WordPress is vulnerable and if not handled properly it can lead to unexpected results. And one of the biggest mistakes that website owners make is not maintaining a regular backup of the site. Most people tend to believe that since nothing has gone wrong so far, nothing will go wrong in the future. But unfortunately this is not true. It only takes one unlucky circumstance for you to completely lose your WordPress site and start all over again from scratch. Fortunately, this can be prevented. And the most obvious solution is to maintain a regular backup of your site. Just like the way we maintain a backup of the important files on our PC or laptop, we should have a foolproof backup strategy lined up for our site too. Backing up your site is mandatory. People who have been using WordPress for a long time is well aware of the importance of maintaining a backup. However, for the less experienced web owners, they fail to understand the necessity of maintaining a regular backup of the contents on their site. It is not uncommon for website owners to not take backups seriously until something goes wrong. It is a hard lesson that they never forget. But if you are smart, you will get into the habit of backing up your website from the beginning. A server is a machine just like our computers and it can crash just like our computers do. Failure of our computer’s hard disk may not affect thousands of people. But if a web server crashes, it may create drastic situations. Server failures may occur due to various reasons like power loss, hardware malfunction, hacking attacks like DOS and so on. But if we have a backup, a server crash may not pose that much of a serious threat to a site. Whatever data has been lost, can be recovered back from the stored backup. If you are running a website, you are always a target for the hackers. And WordPress, being the most popular CMS platform in the world, has made itself prone to being a target for the hackers and spammers. Now you may argue that your site is safe because you have installed tons of security plugins. But trust me, your site is never 100% safe from hackers. Even a single security loophole on your site can make it vulnerable to hacking attacks. So the best precaution that you can adopt is to create a regular backup. That way even if some hacker ruins your site along with your database contents, you can always restore it back from the available backup. This is another issue that is being overlooked. Software issues can became a major threat to a website. Sometimes even a simple faulty code snippet can have devastating effects on your site. For instance, there is a possibility that something might go wrong with the new plugin installation, which may create hindrance in the website’s data. If you already have the latest backup of the content, then you can tackle such issues. No hosting company in the world can offer 100% uptime and reliably. Even the best WordPress hosting companies have had severe problems with their datacenters. The data center might lose network connectivity due to major fiber cuts. Such issues can cause your website to be unavailable for elongated periods of time. This will surely effect your website’s traffic and make your visitors move away to some other site. Human errors are inevitable and even the most experienced web personnel’s can make mistakes from time to time. This could result in implementing wrong changes to your site or even deleting your key files. A small slip up from your side, say an accidental file deletion, can set you back by weeks or months, and sometimes, can even throw away all that you’ve worked so hard for. Natural disasters are unavoidable. A fire break, flood may completely damage your servers and other hardware peripherals. But if you have a recent backup of your files stored on some other location then you can gladly say that your site escaped even a natural disaster. Hosting company backups aren’t specifically designed for WordPress. This means they may not actually help when you need them. The backups may not be regularly scheduled, and they may not be often enough to be useful in case of a disaster. You may not be able to restore a single site from hosting company backups without restoring all sites in your account. You won’t be notified if the backups fail, so you’ll never know if they’ll actually be there if/when you need them. You’ll be at the mercy of your hosting company if you ever need to restore from backup. They probably won’t be as responsive as you think they should be. So by now, you must be well aware of the importance of why you should always keep a backup. Butbefore we get started with the manual backup process, it is important to understand the basics of a WordPress database. Backup the WordPress blog and website files which contain the WordPress web application files, WordPress theme files, plugins files and your uploaded content. Typically, all these files arefound in the root of your website. Wp-config.php, which contains the settings including database connection strings(more details below). What is the WordPress wp-config.php File? Why Create Database Backup Manually? In case of a hacking attempt or after getting hacked, you are thrown out of your own admin area. In these situations, since you cannot access the admin area, it would be very difficult to use a plugin for backup. This is where knowing how to create a backup manually comes handy. It is same as creating a backup using plugin with the only difference that the process is not automated and requires a human intervention. Here, we will discuss different ways of how we can create a database backup manually. phpMyAdmin is an open source software that provides a web based graphical user interface to manage your MySQL database. Most WordPress hosting providers have phpMyAdmin installed in their control panel. 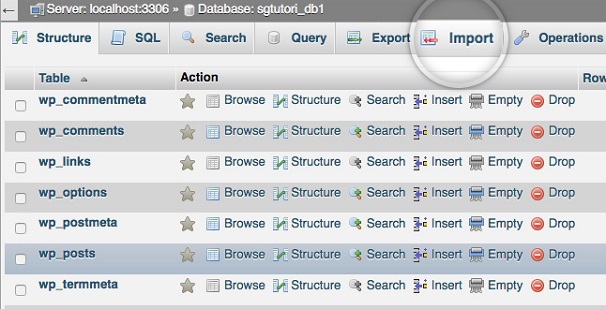 This allows users to easily access the database and perform common database management tasks. First of all, you need to login to your web hosting control panel(also known as cPanel). 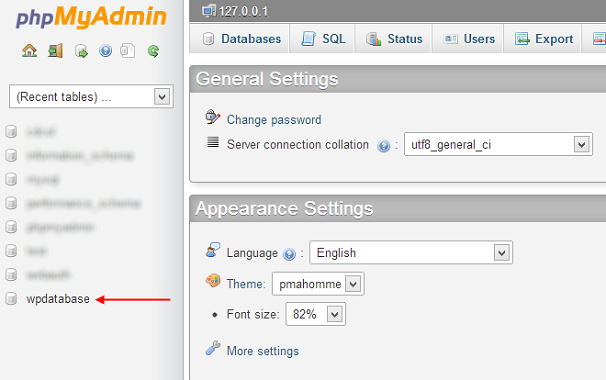 Upon login, scroll down a bit and click on the phpMyAdmin, which would be under the Database section. This will launch the phpMyAdmin window. From the left sidebar, make sure that your WordPress database is selected inside the phpMyAdmin. If it is not, then click on your WordPress database name in order to select it. 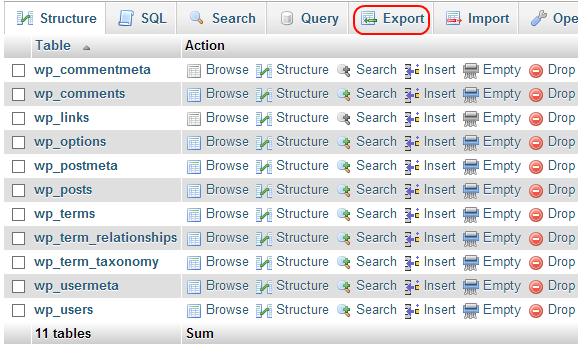 Also when you click on the database name, you will be able to see the list of tables, the database contains.Tap on the “Export link” from the top menu bar to export/backup the database to a file. 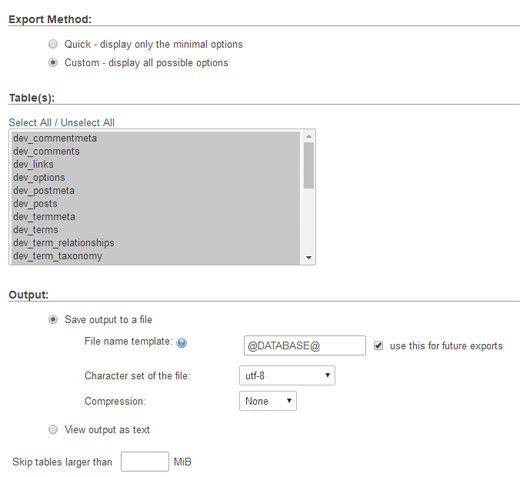 Select the Custom option as it gives you more control about what to export and what not. Clicking on Custom will reveal some more options. First of all, it will show a list of all the tables in your WordPress database. Scroll down to the output section and select the “Save output to file” Select utf-8 for “Character set of file”. For compression, you can select the zipped or gzipped option. 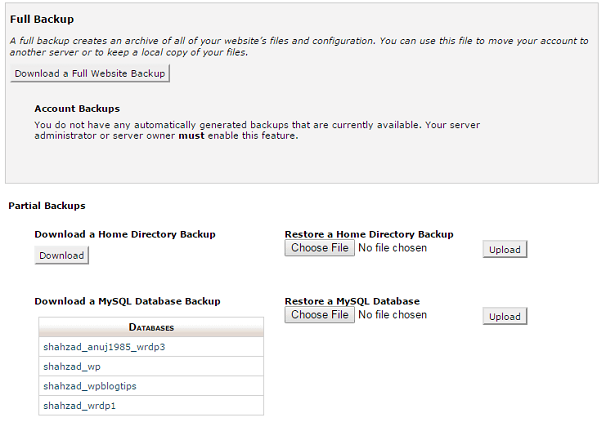 That’s all you need to do to make a database backup for your WordPress site using phpMyAdmin. 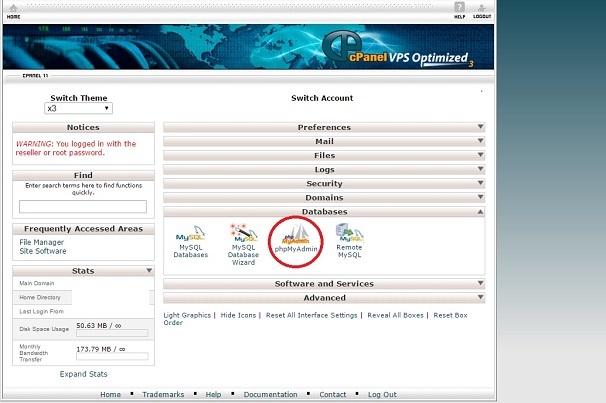 Login to your web hosting control panel (cPanel). And under the Filessection, click on the “Backup Wizard”. Download all the three and save them on your PC or external hard drive. That’s all there is to creating a backup using cPanel. Store the WordPress database file in a secure place, ideally on a different media. If you host your own web server and have access to it via SSH or other protocol, you can make a database backup using a standard MySQL tool called mysqldump. As the name implies, themysqldumptool dumps a MySQL database into a text file which can later be used to restore the WordPress database. 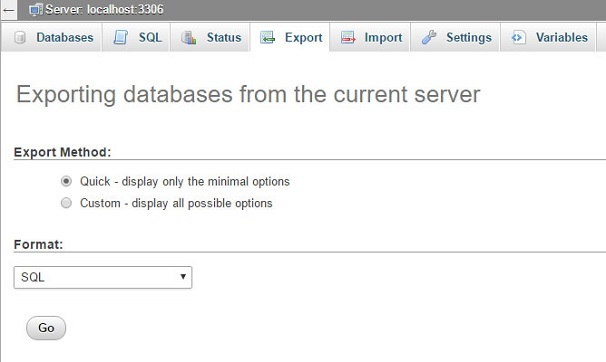 Use the MySQL root user to connect to the MySQL server, select the WordPress database that you want to create a backup for(here wpdatabase) and export it to a text file called wpdb_backup.sql. Here –u is used to specify the username that will be used to connect with the database. In the code above, we are using the user “root”. -p is used to specify the password of the account you are using to connect to the MySQL database server.In our case, the password is “toor”. Wpdatabase is the name of the database that we want to create a backup for. Wpdb_backup.sql is the name of the file where the database dump will be stored. If the file does not exist it will be automatically generated by the tool. Once the database is dumped into this file, download it to your computer and store it in a secure location, ideally on a separate media. Maintaining ascheduled backup of your WordPress MySQL database is the most important thing to do when running your own WordPress website, it is required to restore your blog, it needs to urgently migrate to another host or restore your database from a crashed server. Replace dbpassword with the database user password. In some server, you might need to put a pair of single quote ‘dbpassword’ around the dbpassword for it to work. 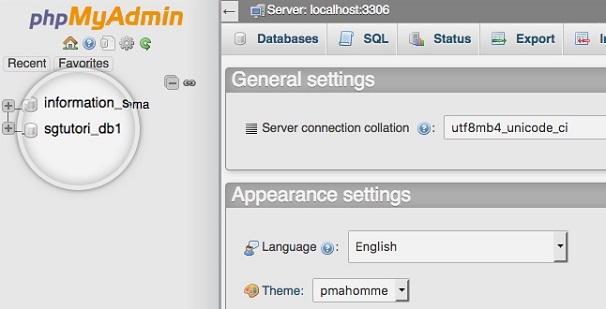 Log in to your cPanel and click the phpMyAdminicon in the Databases section. Select the database where you would like to import your backup. This can be done from the menu in the left sidebar. The import will start and once finished you will be redirected to a page with a confirmation notification that the import was successful. Although these are often the same, sometimes things happen (sites get hacked, plugins conspire to cross wires, your web host changes some settings on you) and you don’t know about it for a week or two, and by then your most recent backup also contains The Problem. Also, schedule your backups with a frequency that makes sense for your site. If you’re posting every day, you probably want daily or weekly database backups. ALWAYS run a backup! You should backup your site database whenever you change its design & content to avoid losing all files and data when the nasty happens. Besides manual backups there are also various plugins that can do the task for you. They are easy to use and requires minimal user interaction. Is there any way we can reach out as your contact form page looks to be broken.